Taste of the Wild is great for your hunting dog needs some food packed with protein. It’s also grain-free which is helpful for many labs who are grain sensitive. Their product can be more expensive than the average brand, but it is worth it by offering all the nutrition your pup needs. With a protein content and fewer carbohydrates than most food, Core Wellness dog food is excellent for that furry friend with a sensitive stomach. The additional protein is extremely beneficial for keeping your long active and strong. This food is too grain-free, so any allergy and digestive issues related to grain won’t be a concern. When you get a puppy you’re already spending a bit more than usual, so saving some extra money without sacrificing quality would be extremely helpful. Diamond Naturals helps with exactly that by giving your lab all the nutrition they need. Their puppy formula includes protein, minerals, fruits, and vegetables. Their food is also home-grown in the USA for those wanting to buy local! If you have a lab that is prone to severe allergies, you should try out Brothers Complete. Their food formula is specially created for dogs with significant allergies. You’ll discover they’re grains, potatoe, and GMO-free. They also ensure they only use the unique proteins your dog needs instead of the ones you need. Merrick Grain Free dog food is packed full of vitamins, minerals, and proteins that provide your senior lab with the wholesome nutrition they need. Gentle on your aging dog’s stomach, your four-legged friend will thank you for this specialized dog food. 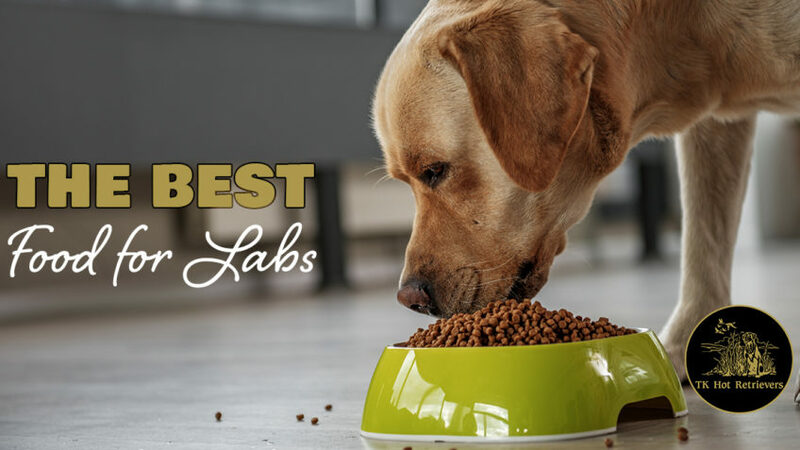 It can be easier to just choose the most convenient and affordable dog food, but then you won’t be giving your lab the best and most nutritious food they need. So to keep Fido healthy try to plan your pup’s diet based on their specific needs, not yours.